King of Comedy Dolphy said that he will accept the National Artist recognition if he given a chance. Many people agree that Dolphy deserves to be named National Artist. Dolphy said in an interview with DZMM, "Well actually ‘yung ibang (recognitions) hindi naman kailangan pero ang National Artist medyo iba ito. Kung baga ultimate ‘yan kaya siyempre kung mabibigay sa akin eh di maganda. Kung hindi naman, okay lang." In the year 2009, Dolphy was included to the list of selection process to become National Artist. Unfortunately, he didn't make to the list of recommendees given to the Office of the President. And to the following year, 2010, Dolphy was honored by President Benigno Aquino III of a Grand Collar of the Order of the Golden Heart, for his contribution to the Philippines entertainment industry. 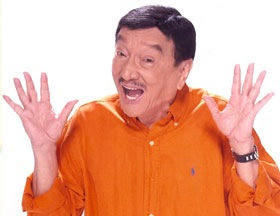 Dolphy was known for his comedy movies such as, "Jack and Jill" and “Facifica Falayfay,” as well as the long-running sitcom "John En Marsha." He also known from his dramas film like, “Ang Tatay Kong Nanay,” directed by National Artist Lino Brocka, and “Markova: Comfort Gay” for which he won several acting awards. He is now at age 83 and turning to 84 this coming month of July. Comments or suggestions about "King of Comedy wants National Artist Awards" is important to us, you may share it by using the comment box below.